The word Nicaragua can be translated, roughly, as “Land of Lakes and Volcanoes.” It’s an accurate description of the tooth-shaped Central American country’s topography. A chain of volcanoes, seven of them active, twists across Nicaragua from north to south. 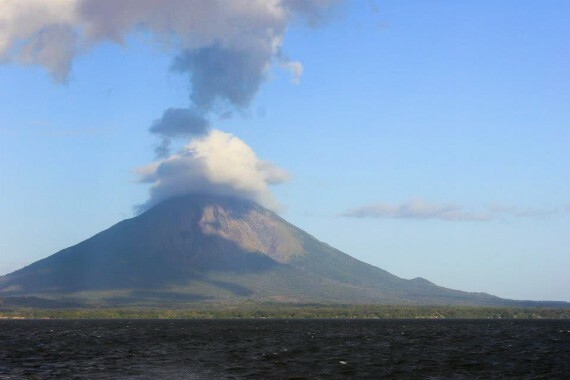 One of the largest, Concepcion, dominates Ometepe, an island in the middle of Lake Nicaragua. Concepcion last erupted in 1986 yet remains active. A steady discharge of gas and ash from the volcano’s fumaroles reminds locals that it could come alive at any moment. I journeyed to Ometepe in January, but not for any reason related directly to the volcano. I was hoping to find sunny, and fairly affordable, escape from the winter slog of Washington, DC. En route to Ometepe, I had soared through the jungle outside of the capital city of Managua on a ropes course, lazed around a secluded crater lake, and marveled at the pastel-colored churches and homes in Granada, one the oldest colonial village in the region. El Indo Viejo, the hostel I booked for two nights on Ometepe, is an animal refuge for monkeys, whose muffled squeals, issues from high in the trees, form there own kind of white noise. Anticipating days spent sunning on remote beaches and nights spent speaking functional but imperfect Spanish with strangers under the moon, I had stuffed my forest-green REI backpack full of dresses and bikinis. At an artisan market in the village of Masaya, nursing a growing fondness for Nicaraguan rum, I had added to the bundle a set of wooden shot glasses. If there was any question as to whether I had come to Nicaragua to kick back, one needed look no further than my shoes. The four-year-old Asics had about as much tread as my other pair of shoes, gold sparkly thongs from Payless, which is to say none. But there was Volcan Concepcion, stretching nearly a mile into the sky, visible from every corner of the island. There was Concepcion, beckoning. The hostel was running a deal on a short tramp up the mountain, halfway up, halfway down, a hike tailored to amateurs. Without much thought, I signed up to make the six-hour trek with a trio of Argentinian girls also staying at the hostel. A few hours later, after a dinner of fish tacos, I learned the bad news. The Argentinians had been pickpocketed. They needed to find an embassy and recover money and passports. Without climbing mates for the abbreviated route, my only choice was to join another group the next day. They were doing the full hike, estimated to take 10 hours and require better-than-average stamina. At the front desk, I pulled my shoes out of my backpack. “Can you hike a volcano in these?” I asked Ana, the proprietor. She walked them over to the bar and handed them to her husband, Usagui, who twirled the shoes in his hands, checking every scratch and insole, looking admiringly upon the tattered sneakers as if they were two exquisite dolls. He gave a thumb’s up. “Estan bien,” Ana relayed to me, sounding exceedingly sure about the durability of both the shoes and me. We met our guide, Neftali, in the hostel’s café the next morning. Our group was three Germans and a Swiss backpacker named Heinz. It was 7 am. Neftali was in a hurry. He swore the bus that would drop us at the foot of the mountain was less than two minutes from leaving. It was, apparently, the only thing in Nicaragua that ran on time. We scarfed spoonfuls of scrambled eggs then scooped up our backpacks, which the hostel cook had weighed down with ham sandwiches, Cliff bars, and water bottles. One of the German girls, Rosie, was missing. She emerged from her room a few minutes later in skinny jeans and fashion boots. Her travel mates shot her a salvo of dirty looks. The shenanigan had caused us to miss the bus. Perhaps being in Nicaragua had made us reluctant to spend money unnecessarily. No one wanted to scrape together even the few córdobas needed for a cab ride. So we set out on foot. The dirt road was slightly uphill with brightly colored homes every 20 or so feet. Many of the families were in their yards waving, and those who were feeling more awake shouted out to Neftali while their pet dogs and pigs roamed alongside. We still hadn’t made it to the sign for Concepcion when Lisa, another one of the Germans, said she needed a break. Peeling back her right sock she revealed a freshly tattooed peacock covering two inches of ankle flesh. The pause meant cigarettes for the others, a move that did not bode well for our pace. The trees were shielding the sun when we finally arrived at the trailhead. Jungle all around, it felt like we were the only people in the world. Howler monkeys were in abundance, though. Their moans swelled through the treescape. The occasional banana tree broke up the monotony of shade, bugs, and pointy branches along the steepening pathway. Chat ensued. In a short time I knew as much about our guide as my friends back home knew about me, and Neffie seemed a rather more appropriate thing to call him. Like many Nicaraguans I met, Neffie had an easy way about him. He held little back. On another stop during the trip, in the southern beach town of San Juan del Sure, I had encountered a whole contingent of Americans from the West who visited and never left, spurred by the sense of community that they found was a heightened version of home. Neffie told me he had been a cop, an EMT, a martial arts instructor, and even a bodyguard for runway models. His compact frame would not have suggested a resume of physically demanding professions, yet his gliding suggested a well-seasoned climber. Several years earlier, when a law was passed that required climbers to use guides, he had eagerly applied. Three hours had passed by the time we emerged from the jungle back into the light of day. It was the point where hikers rest and regain strength for the vigorous two hours to the top. It would have been the turnaround for me if the Argentinian girls had not been robbed. Instead the group I had been forced to join climbed out of the covered portion of the trail and sat snacking on sandwiches in front of a vista of endless green plains. On we climbed. The wind gained strength. In the cover of the jungle, even shaded over, it had been 90 degrees. Now that the trail had opened up, the temperature plummeted. We put on hoodies and jackets over sweaty tees. Ragged rocks replaced dirt beneath us. It became harder to step, harder to keep apace. Skinny-jeaned Rosie and her boyfriend lagged farther and farther behind. We offered to wait on them, but Neffie disagreed. “We have to get to the top by 1,” he told us. If we didn’t, there was a chance we wouldn’t make it back down before sunset. So the couple agreed to wait along the trail while we trudged ahead. I kept in step with Heinz and Neffie, the adrenaline concealing any pain in my legs. Grey clouds of smoke obscured the path ahead, making it impossible to tell the distance left to travel. Then, without warning, rocks came hurling in our direction. We ducked then looked up withe caution. A group of four teenage boys 20 feet ahead was cackling and scampering from rock to rock on what Neffie said was not the designated trail. He whipped out his phone and began to dial. I made out scattered words like “abandon” and “turn back.” Off the phone, he mumbled under his breath, embarrassed by the boys’ antics. “If they don’t cut it out soon, we might not be able to go higher,” he said. I reached down. Sure enough, the mountain was burning. It was no longer possible to ignore the fact that Concepcion was an active volcano. 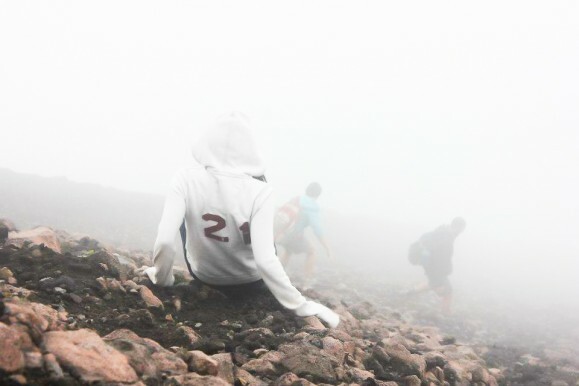 Unable to see them, we followed the voices of Neffie and Heinz until we reached the top. At least we assumed it was the top. A hazy fog of ash, the thickest we had set yet, obscured our view. We were high, my calf muscles told me. But there was no perspective beyond five feet in front of us. “It’s a few minutes after 1,” Neffie told us. Our celebrating now had a time clock. We had less than 10 minutes to stand at the summit and appreciate our feat before we needed to take to climbing again. Lisa and Heinz still had battery in their cameras, so we switched off posing, arms around each other like lifelong mates. Between the wind and the small surface area of the peak, we had to hold onto each other to remain steady and upright. Moving in sync, the three of us jumped around with sudden bursts of energy. Reaching the top, we soon learned, didn’t signal the end. The way down was just as rocky and substantially more difficult to grip. Without any traction from my sneakers I could do nothing but slip. Soon I needed at least one hand down to brace myself in a bending squat formation that resembled a crab walk. Heinz bounded ahead, picking up speed as he went. Rather than slipping he was gliding, a graceful snowboarder with his feet taking on the role of the coasting board. Lisa struggled, too, but now I was the one holding up the group. With each slide I chuckled in an attempt to psyche myself up. With the next fall, though, my left hand went down to brace me and there was a loud pop. The bone in my index finger was out of alignment. A surge of pain crackled from top to bottom. I called for Neffie. Before I could get out a word, he popped the joint back into place and reached inside his backpack. He produced a roll of silver masking tape and used it to adhere my injured digit to the middle finger. We had three more hours to go. “You’ll be OK?” he said, shaking his head in the affirmative. One foot in front of the other. Left. Right. Slide. Shimmy. The internal dialogue kicked in, and I knew I had to will myself to maneuver through the rocky portion of the trail. I imagined the covered jungle. Getting there was the goal. From there came ease. The repetition made the time pass. I kept slipping, but I stayed mostly on my feet. From time to time I could hear Neffie or see Lisa’s blonde ponytail. But this climb was mine to finish. Soon enough, I did. Our group was reunited, including the two we had to leave behind, at the point that the volcano switched to jungle. A flood of relief filled me. The mountain cooled beneath my feet the deeper we descended. The smoke dispersed and with it the worries I had carried with me from Washington. The tropical scenery worked its magic on the fury of my life. Dena Levitz, a contributing writer to EthnoTraveler, is the manager of digital strategies for the Newspaper Association of America. She is currently pursuing a Masters in Media Entrepreneurship from American University.